I like to point out that a nation's economy is very different than a nation's Olympic team. With the Olympic team, a relatively small number of extraordinary athletes can make a country look good, even if the rest of us are snoozing on the sofa while watching on television. But in the national economy, having a few extraordinary companies or workers isn't enough. For a nation's economy everyone counts. If substantial groups of people are not gaining the skills and experience to work up to their capabilities, the economy as a whole suffers. If a substantial number of industries are not seeing an ongoing increase in productivity, then productivity at the national level will suffer. 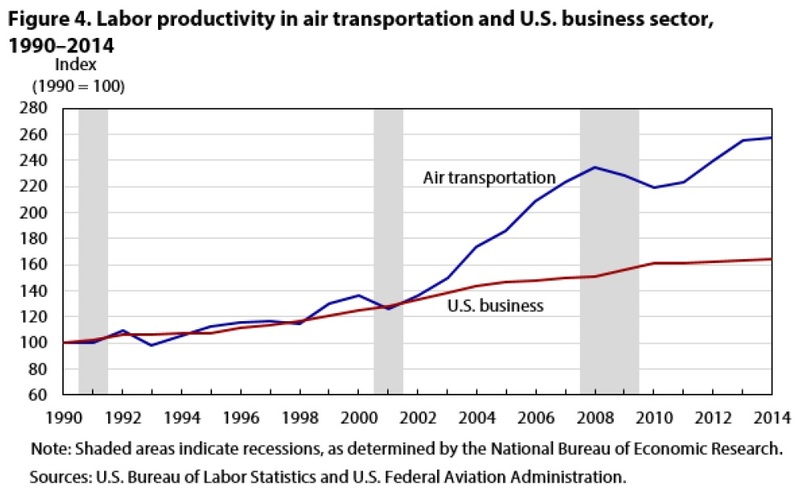 Matthew Russell points out in "Economic productivity in the air transportation industry: multifactor and labor productivity trends, 1990–2014," published in the Monthly Labor Review (March 2017). As the title implies, a main focus is on productivity in air transportation, but this story is set in a broader context. At the top of the list, it's no surprise that "Computer and electronic products" lead the way, given teh pace of innovation in that industry. But at least to me, seeing "Air transportation" as the second industry on the list is a surprise. At the bottom of the list, the surprise for me is that 19 industries averaged negative productivity growth over this 17-year period--not just slow productivity growth, but actually negative. Last week I wrote about one of those industries in "Sagging Productivity in Construction" (March 6, 2017). Sure, there are lots of tricky measurement issues here in looking at the quantity of output, and making appropriate adjustments for quality. But even with that taken into account, the range of average annual productivity values from positive to negative is still quite striking. What happened in the airline passenger industry? Here's a pattern of labor productivity in that industry since 1990, compared with the overall US business sector. Clearly, something happens to jolt productivity in this industry around 2002. 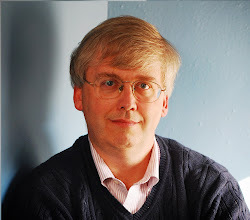 Russell goes through the experience of the US airline industry over this time period in some detail. For this industry, output is measured by passenger-miles and by ton-miles for freight. Here are some nuggets about what drove the rise in productivity in the late 1990s and early 2000s (footnotes omitted). 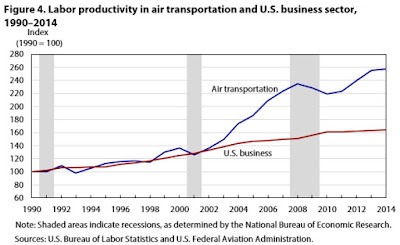 "The period from 2002 to 2007 saw the largest labor productivity gains in the air transportation industry over the 1990–2014 timeframe examined in this article. The increase was an average annual 9.8 percent, driven by strong output growth of 5.2 percent and falling labor input, at a rate of 4.8 percent. Labor input among legacy carriers fell as the carriers shifted their production model to meet the low-cost carrier competition’s business model. "Roughly three-quarters of the strong output gains in the 2002–07 period were attained through the use of narrow-bodied, single-aisle aircraft accommodating at least 60 passengers, and roughly 80 percent of the growth in output was attributable to the low-cost carriers. In particular, Southwest Airlines, which flies only one type of aircraft, a Boeing 737 single-aisle airplane, recorded an average annual 9.3-percent increase in revenue passenger miles, a percentage that led the low-cost carriers’ contributions to the overall 5.2-percent output growth. "Declines in airline transportation employment during this period, led primarily by the legacy carriers, contributed to the sharp average annual decline of 4.8 percent in labor input. Throughout the mid-2000s, several airlines declared bankruptcy in order to restructure their debt and renegotiate labor contracts with unions. US Airways, United, Northwest, and Delta all initiated bankruptcy proceedings during the 2002–05 period and immediately sought ways to reduce their labor costs. The establishment of low-cost carriers with reduced labor costs forced the legacy air carriers to find ways to match the low-cost carriers’ savings ... Also, labor unions made major concessions. For example, in 2003, the pilots, mechanics, ground crew, and flight attendants of American Airlines gave back nearly $2 billion in wages to the carrier in an attempt to help avoid bankruptcy. In addition to these wage concessions from the various labor unions were productivity concessions on the part of American Airlines workers that would reduce the carrier’s workforce by 2,000 to 3,000 workers. ... In 2005, to boost productivity, Delta made major scheduling changes at its Atlanta hub. Such changes had been initiated earlier by American Airlines. The objective was to spread arrivals and departures more evenly throughout the day, limit congestion, and increase productivity. In another move, Frontier pilots agreed in 2004 to shift from a salaried pay system to an hourly pay system as a way for the company to increase pilots’ productivity by incentivizing them to fly more." As usual, one's perspective on the productivity gains in air transportation will tend to depend on whether one is mainly a purchase of airline tickets, or whether one works for an airline. But it's useful to remember that this upheaval and job losses in US airlines was unrelated to international trade. Like most of the disruption and corporate distress that occurs in the enormous US domestic market, it was about disruptions from technology interacting with competitive struggles between US producers--with consumers benefiting from the result.